Craig Moser is an artist & painter based in Pflugerville, Texas. 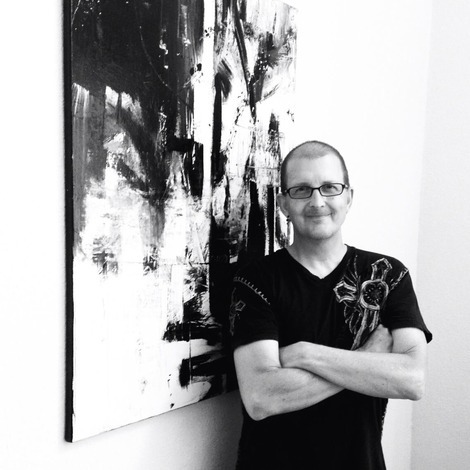 He specializes in original, one-of-a-kind abstract art, and his work has been displayed in exhibits and private collections across the US. Craig graduated from The Ohio State University with a degree in Industrial Design and has worked professionally as an artist and designer in both Miami and Austin. "My work is very experimental and heavily influenced by music, people & my environment. I work primarily with bold, rich colors and strive to make each piece unique and original. I'm interested in what paint can do - the lines, forms and colors responding to my thoughts and actions. I choose to work primarily with acrylics and enamels due to their ease of application, fluidity and relative fast drying time. Because of this, I'm able to work quickly and maintain a continuous flow in my process. I strive to make my art visually exciting, engaging to the eye, and stimulating to the mind of the viewer."